We began as a specialty plant nursery featuring dark maroon colored plants and over the years began making more and more chocolate themed products. Our quality farm-made products make wonderful gifts! 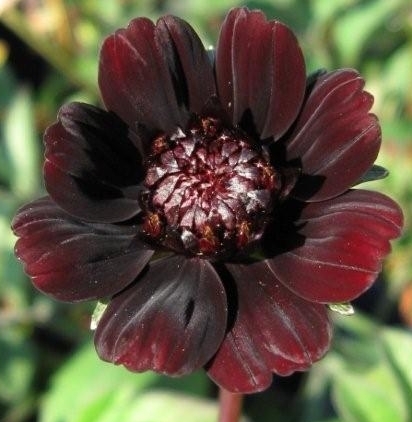 Our most popular plant ... Chocolate Cosmos (the flower smells like chocolate). ***New for the first time EVER! Chocolate Cosmos seeds! Viable seed was discovered in Europe and is now available. We specialize in rare, unusual and often exclusive to Chocolate Flower Farm seeds. 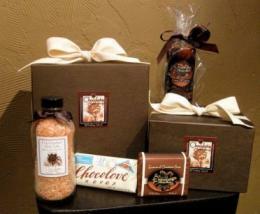 Our "Box of Chocolates" makes a wonderful gift for your favorite chocolate lover. It includes our raspberry & chocolate jam, essence of chocolate candle and chocolate mint tea. Packaged and ready for gifting...sure to bring a smile to someone you care about. The media has been very kind to us with feature articles in magazines such as Martha Stewart Living, Sunset, Better Homes & Gardens, HGTV, Coastal Living and many more. A few of our top sellers.... click on the photos or click on Shop the Garden Shed for our full product offerings. I just received the package. You are the best! I appreciate everything you did from start to finish with my order. The candles are fantastic, your packaging, shipping, customer service is beyond description. You are unbelievable. I will spread the word about your items and the customer service I received. Everyone that receives a candle tomorrow will be thrilled. We began as a specialty plant nursery offering selections from our extensive collection of "chocolate" (dark colored) plants and rare perennials. 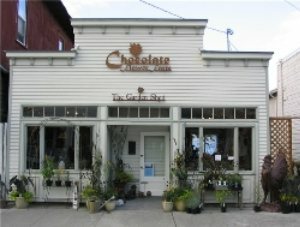 We moved to our 1923 farm just outside of the seaside village of Langley on Whidbey Island in 2005, opened our nursery, and due to the popularity of our gift items (especially our famous chocolate candles!) we opened a little shop in Langley offering products for the home, garden and gifts ~ with a chocolate twist. Our farm-made chocolate themed products are now even more popular than our plants and we are the "go-to" place for quality chocolate gifts. Our products are available here online as well as in stores all around the country... see the Where to Buy section to find a retailer in your area. As those of you who have visited our shop know, our chocolate candles are by far our most popular item .... We transformed one of our out buildings into a special candle workshop where we hand pour and hand glaze the candles ... now the whole farm smells like chocolate! In addition to the candles, we offer a top quality line of all natural chocolate infused bath and body products, Raspberry & Chocolate Jam, Chocolate Garden Seed Kits and a full line of individual seed packets from our plant collection. ~Happy Gardening & Gift Giving! P.S. Check out the HGTV show "Gardening by the Yard" with Paul James all about our farm. If you would like to receive our monthly newsletter of our farm goings on, just click on SITE MAILING LIST at the bottom of this page ... we include a special word code for 10% or more off for the full month in each newsletter and we never share your info with anyone - we promise ... Gardener's Honor. We are continually searching for rare plants, unique home & garden accessories and distinctive, different and delicious gift items ... we hope you enjoy your visit and come back often to see what new treasures we have propagated and found. We ship all around the world so we hope that you will think of us for your holiday and year-round gift giving. We have Eco-friendly chocolate gift boxes so you can select from our various chocolate themed gift items and give "a box of chocolates"
We reopen in mid April and look forward to your visit! Great Last Minute Gift Idea ~ A Chocolate Flower Farm Gift Certificate ~ the code is sent shortly after ordering via email so no worries about shipping. Select one or more of our chocolate themed items and we will package and ship them to all of the chocolate lovers on your list on the date that you request, with a note from you included. Simple, elegant and unique gift giving. Ideas include: Rasperry & Chocolate Jam; Chocolate Mint Tea; Chocolate, Coco Havana or Whidbey Pine Candles; Pink Himalayan Bath Salts infused with Chocolate; Chocolate Sunflower or Chocolate Viola Seed Packet; Chocolate Garden Seed Kit; Chocolate Mint Tea. Mix and match and have fun knowing that this will make those you care about smile when they receive it. Online Store Directory ~ Click on any of the links below to go directly to those items. If you enjoy our monthly e-newsletter (click on "Site Mailing List" above to sign up for newsletter - we do not share your info with anyone, ever, promise!) you will certainly enjoy following us on Facebook as there is much more day to day news, photos and occassional videos ... come like us, you will be happy that you did! Copyright © 2019 Chocolate Flower Farm. All rights reserved.